Outermost gathering spot at quiet time of year. At the far western tip of the Island, where time seems to stand still in the winter, one shop has remained open since Labor Day. 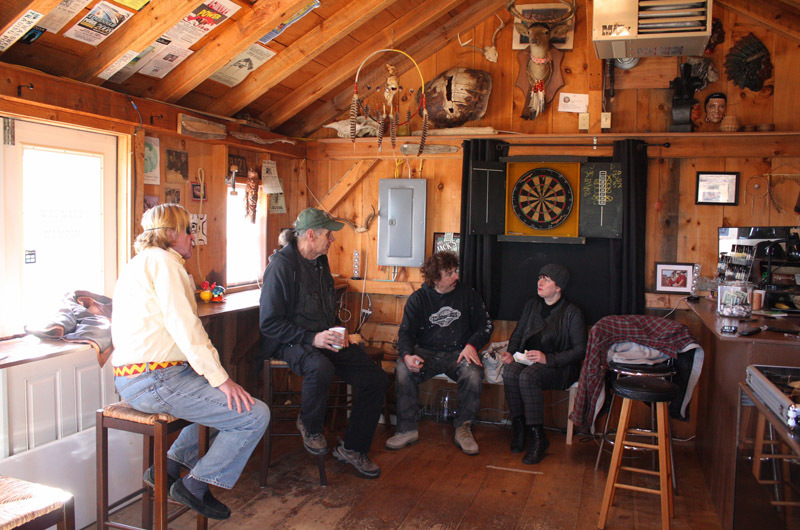 On a bright afternoon this week, the sound of classic blues filled a small wooden room perched above the Aquinnah Circle. 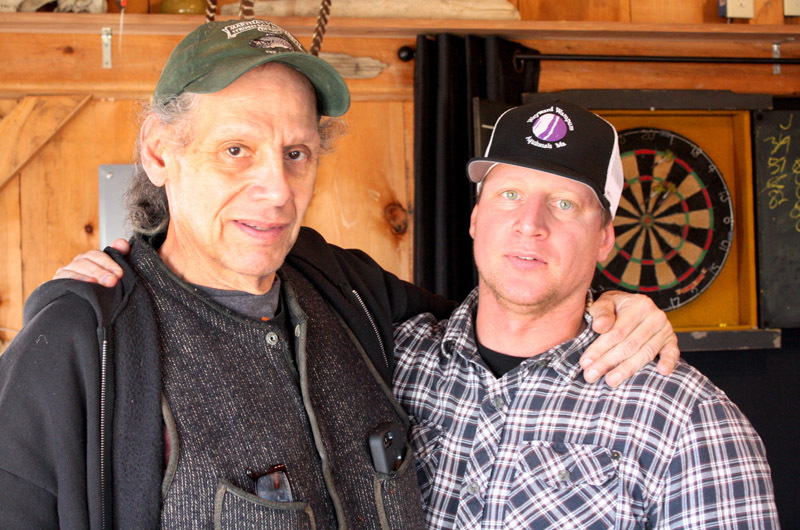 Jason Widdiss took aim in front of a dartboard, as his father, Donald Widdiss, discussed politics with Jib Ellis, a local author and Aquinnah resident. A few darts struck the board near the bull’s eye. “Slot machines are coming next week,” Mr. Widdiss joked. “You can bet on anything,” added his father. Wayward Wampum is likely the first shop at the Circle ever to stay open through the winter. 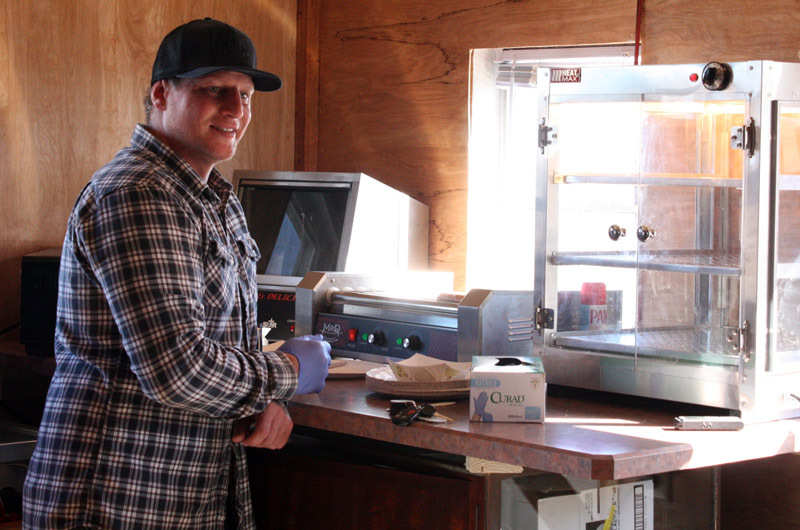 Jason Widdiss took over the lease from his father, owner of the former Howwasswee Trading Post, last year and set things in a new direction. A simple menu of hot dogs, beef pockets, soda, snacks and coffee has been enough to draw residents out to the Gay Head Cliffs at the quietest time of year. Through the windows, customers can see the rolling heathland along the shore and the red and white flash of the Gay Head Light across the Circle. The shop also sells jewelry made by Mr. Widdiss and his partner, Tiffany Vanderhoop, local photography by John Wightman, and copies of Mr. Ellis’s novel Bandstand: The Search for Oak Island Gold. 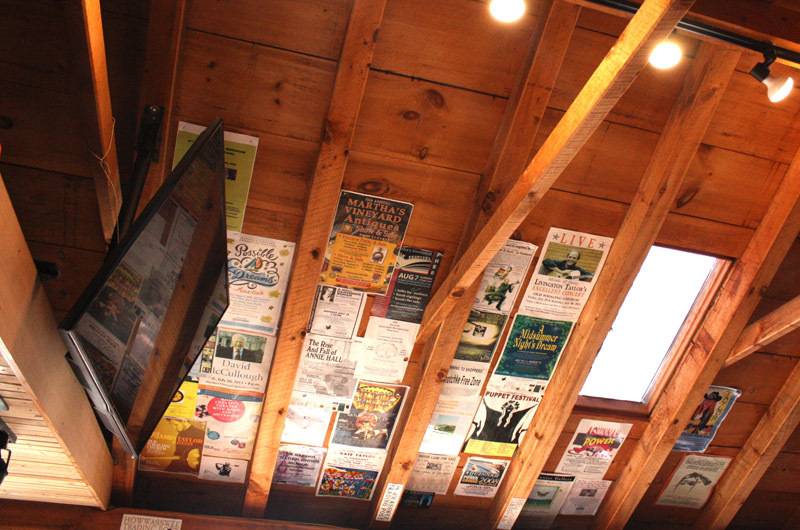 A wide-screen TV hanging from a rafter broadcasts old boxing matches or music to suit the mood. 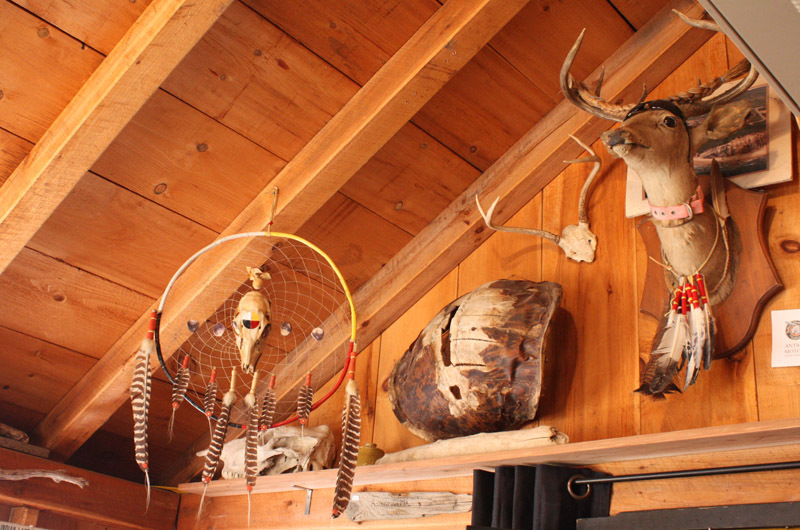 Native American art and Island memorabilia, including a piece of the sunken ship City of Columbus, adorn the walls. The shop serves about 10 customers daily between 11 a.m. and 2 p.m., which is about what Mr. Widdiss had expected when he decided to stay open for the winter. More importantly, the shop expands the social landscape in a part of the Island where many have become accustomed to a lack of activity in the off-season. For now, Mr. Widdiss will likely keep the menu to a bare minimum to avoid waste, but he hopes to add items in the summer. The Orange Peel Bakery, just down the road, has been supplying pizzas in the off-season. Behind a glass counter filled with jewelry, Mr. Widdiss keeps some of his tools for carving the wampum he collects in Menemsha Pond. That gives him another place to work, and he often keeps the shop open at night. “I always tell people, if you see the lights on, come on in,” he said. But the official hours of operation are also kept to a minimum. Every object in the shop tells a story. Beside the counter hangs a photograph from 2006 that shows Mr. Widdiss landing a hard right cross on his opponent in the ring. He competed in the Golden Gloves boxing competition in Lowell before an injured hand put him out of commission some time ago. In addition to Wayward Wampum, he hopes to launch a boxing program for Island kids. In the past, he has offered training at his home in Aquinnah, but with young children of his own and other priorities, he hasn’t had time to keep it going. Another photograph shows Donald Widdiss with Marshall Lee, co-owner of the neighboring Hatmarcha Gifts, where Jason Widdiss had previously showcased his jewelry. “It was interesting taking this shop over, because next door was my main selling gallery,” Mr. Widdiss said. But Mr. Lee and his wife, Martha Vanderhoop, encouraged the venture. “I was on the fence about it but they were full-on supportive,” Mr. Widdiss said. He added that the town and the Wampanoag Tribe have also offered support. “I didn’t meet any resistance from anybody,” he said. From his winter perch, Mr. Widdiss has observed a constant trickle of sightseers at the cliffs, where many thousands visit in the summer. “On a nice weekend, there’s 40, 50 people coming and going,” he said. Even in the bitter cold, some still make their way up to the lookout to admire the cliffs and the Gay Head Light in the distance. The VTA still makes its hourly stops at the Circle, although most visitors in winter drive their own cars. “They get all huddled up and they run as fast as they can, and then you see them run back down and take off,” Mr. Widdiss said. A large banner with the words Now Open hangs above the entrance to the shop, facing the Circle, but promotion has been a challenge. “I think half the people think I just left the signs up from the summertime,” Mr. Widdiss said. But as word spreads, business has picked up, even as many other Island shops remain shuttered for the season. I cherish my Wampum necklace made by Donald Widdiss. I wear it all the time. It gives me peace, and strength. Good idea to get people out and about to visit the best part of the Island, have a good bite to eat, play some darts and look out over the ocean. I love Aquinnah in the off season. Your wampum is an excellent gift and value, too. I have had the pleasure of working, living, having a great friend in Jason Widdiss. He is always a go-getter and doesn't stop until he has reached his goal. I would watch Jason make his Wampum jewelry and also purchased a pair of items from him for my mother. My mother has since passed but the love that Jason puts into his work will never fade. If you want Wampum or just some good ole conversation make sure to stop by and tell Jason that Cwalinski sent you!! Great article. Makes me hunger for a beef pocket and some good conversation. See you guys by April.